Back in June we enjoyed a tasty breakfast at Starling Diner in Long Beach. 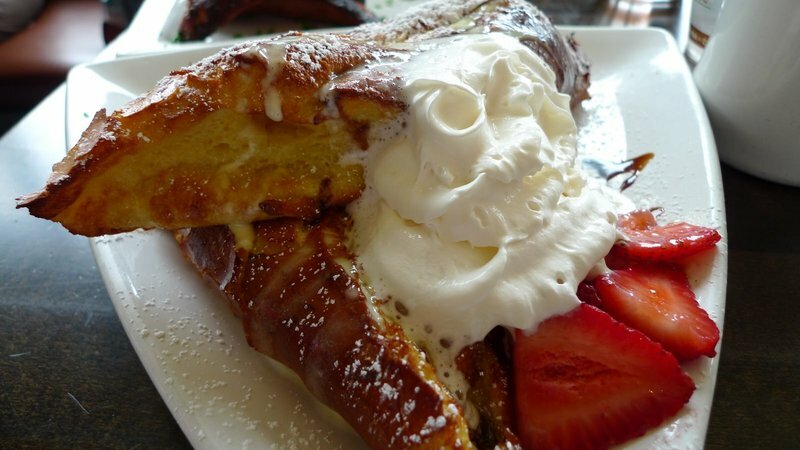 They serve this amazing dish called San Francisco Stuffed French Toast, which is a baguette filled with mascarpone cheese, dipped in creme anglaise, and broiled – not fried! – until golden and crisp. (Full entry about that meal here.) Ever since that visit, I’ve been curious to try making that dish, just to see if I can understand its mechanics. Finding myself with an extra half of a baguette last week, I turned to the internet for potential recipes. While there wasn’t an exact recipe, I was able to piece together a few recipes to guide me. 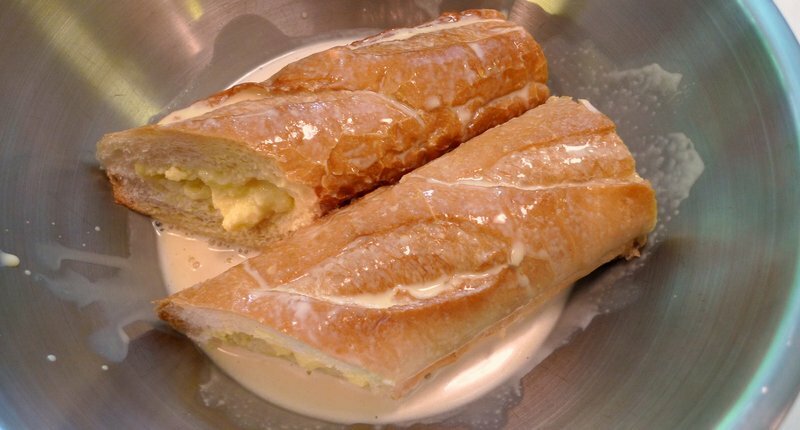 I had to resolve three key issues: make a creme anglaise, create a tasty mascarpone cheese filling, and then figure out how to construct and cook the baguette so it came out with a crispy exterior and moist but cooked interior. 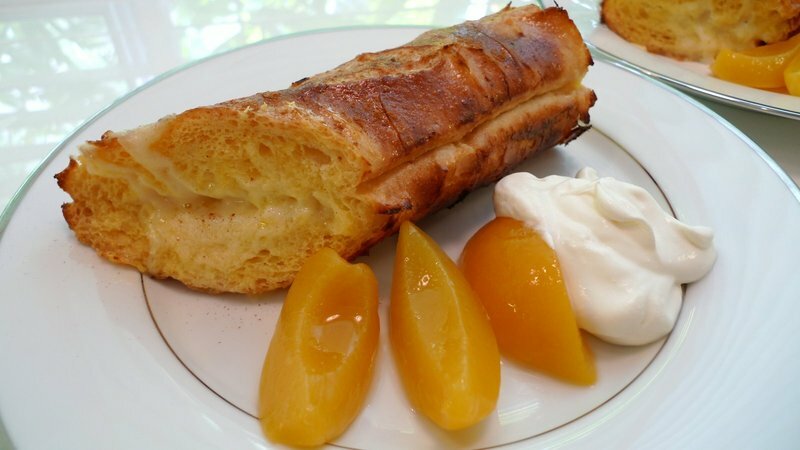 The ingredients were pretty simple: a slightly stale baguette, mascarpone cheese, milk, cream, egg yolks, and vanilla, and some fruit to serve on the side. 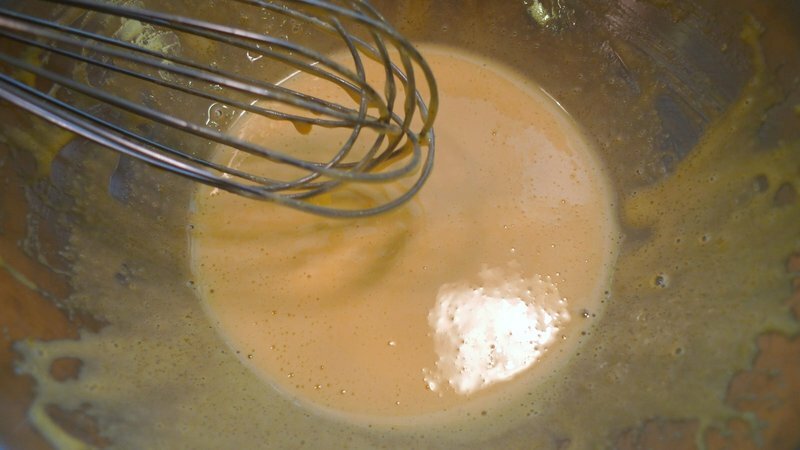 A creme anglaise is basically a custard sauce. In and of itself, it isn’t terribly complicated, although I suspect that my technique would improve if I had more experience making it. 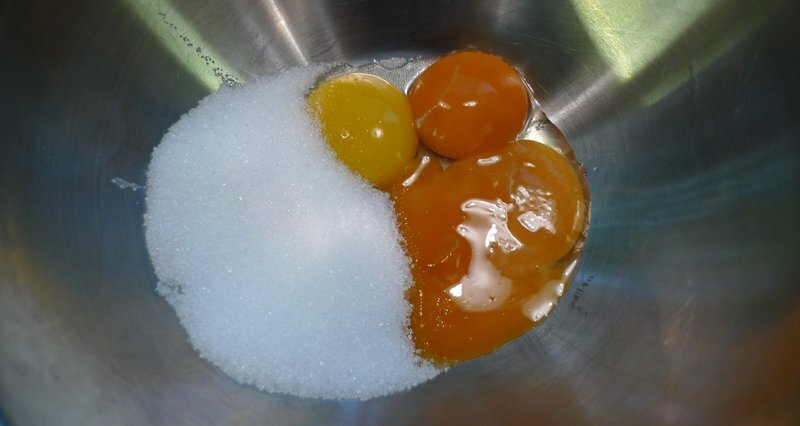 I whisked three tablespoons of sugar into three egg yolks until pale yellow. Ideally, you would use ultra-fine sugar rather than regular granulated sugar, to make it easier for the sugar to dissolve. 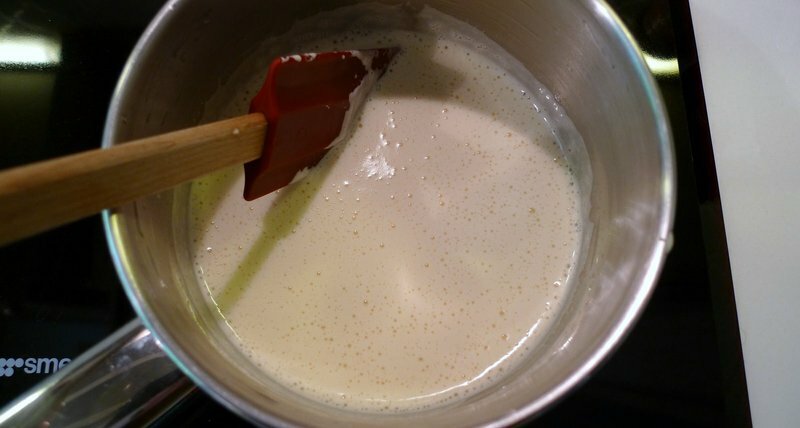 Next, you heat a mixture of half cream and half milk until it is not quite to the point of boiling. 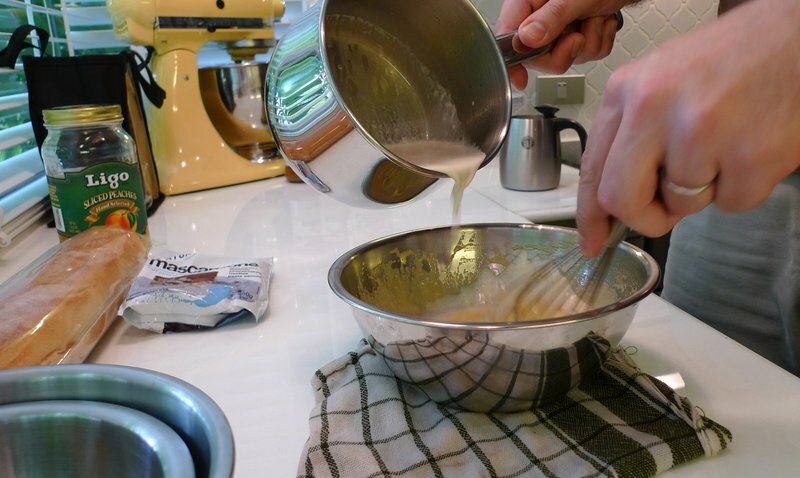 Then, pour the milk into the egg mixture slowly, whisking constantly so the eggs do not scramble. 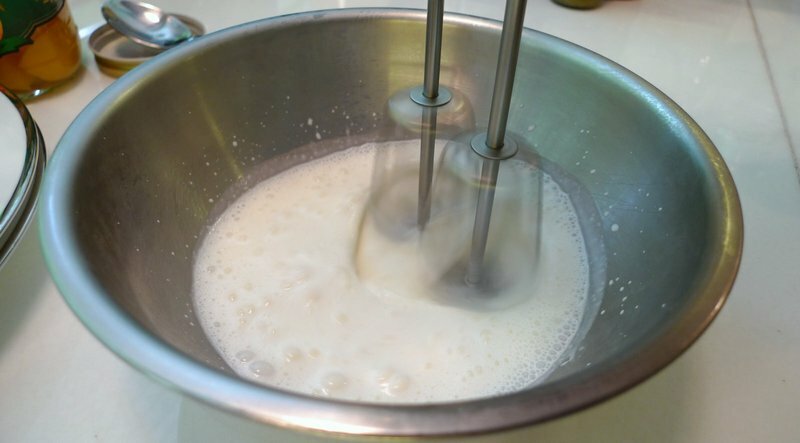 The mixture is then returned to the stove and cooked gently (stirring constantly) until it reaches 160 F. It can then be strained through a wire mesh to remove any clumped bits of egg and then allowed to cool. While the creme anglaise cooled, I whipped the mascarpone cheese with a little sugar, a tablespoon of juice from some canned peaches, and a pinch of salt. Something about that caused it to coagulate a bit, so next time maybe I’ll just stick with a splash of honey and leave the salt out. 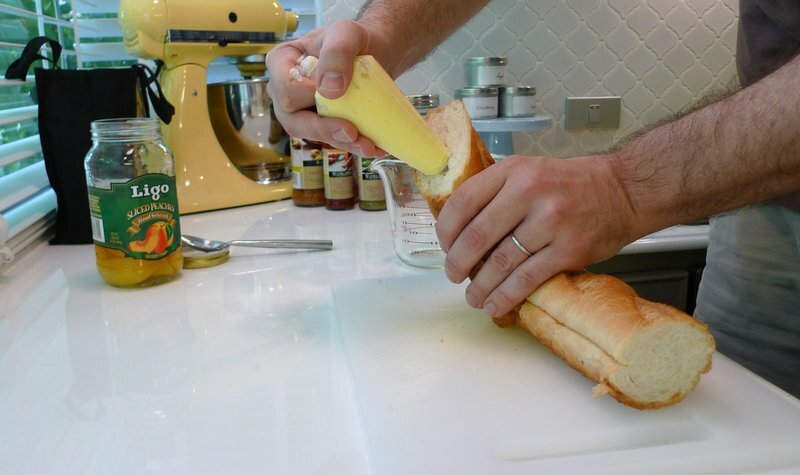 The big challenge was figuring out how to stuff the baguette. Slicing it open seemed problematic as the cheese would easily ooze out while cooking. I tried sticking a serrated knife into one end of the bread, cutting a small pocket. 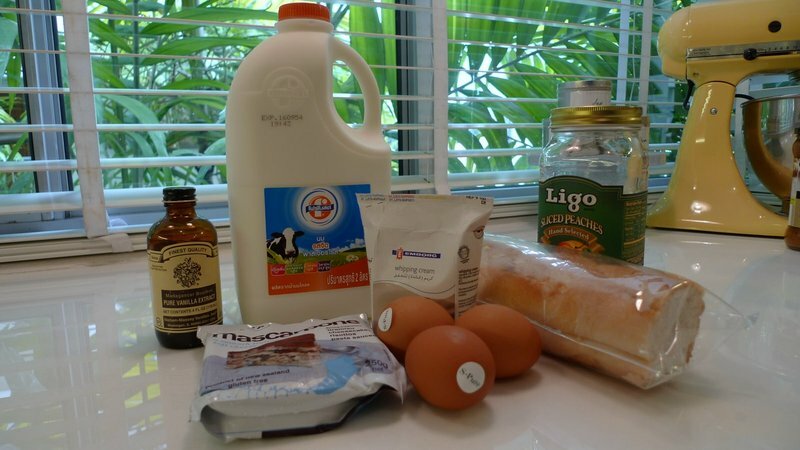 Then, I piped the mascarpone mixture into the bread. All in all, this worked fairly well although it makes the dish a little more complex and dirties a few more kitchen implements. Next, I let the stuffed baguette rest in the creme anglaise, turning about once a minute, for a total of about four minutes. I then place the baguette pieces on a parchment lined baking tray and put under the oven’s broiler, turning once, for a total of about eight minutes or until crispy and golden. While the bread broiled, I whipped a little cream to use as a condiment. You could also prepare any fresh fruit – berries, bananas, peaches, etc. – to go with the dish. I opted for canned peaches as I had a jar open in the refrigerator. The finished product. The mascarpone filling melted, which I recall being the case with the original, and gave the interior a rich sweetness. The outside was crispy, although I’m not sure the baguette was really stale enough to get the right texture; it was still a little soft when I started this process and not as dry as would probably be best. All in all, I think it turned out nicely and would be worth playing around with a bit more. However, it definitely takes more effort than other versions of French toast I’ve had! This entry was posted in Uncategorized and tagged Baguette, breakfast, Brunch, cooking, Creme Anglaise, Diner, food, French, Long Beach, Mascapone, San Francisco, Starling, Stuffed, Toast by christao408. Bookmark the permalink. Looks good! This is the ‘healthier’ looking version without the powdered sugar. Add a side of bacon and sausages too, maybe? @CurryPuffy – Oh, yeah – the bacon and sausages will definitely make it healthier! Ha ha! Looks great and healthy! Not sure I have the patience to make it! I’d eat this anytime – if someone else made it… If I’m on my own I’ll stick to the tried and true, quick and easy version – plain ol french toast. hehe! I bet it was tasty though. How come I didn’t see that when I was in SF? I would have totally wanted to try it out had I seen it. @Roadlesstaken – Well, while it is called “San Francisco” style, I’ve never seen it there, either. I think it is called that because they use sourdough bagettes. The restaurant that served them is in Long Beach and is well worth a visit next time you are down that way. @murisopsis – Perhaps if I used thick-cut bread (Texas toast or thicker?) I could make this a bit easier than with the baguette. The thing that was an improvement over the norm was having creme anglaise instead of just beaten egg. Richer! @Fatcat723 – Healthy? In small doses, perhaps. =D@The_Eyes_Of_A_Painter – Thank you. @iskrak – Well, I think from a professional cook’s eye, my lack of focus and ability to stick to a recipe must be disturbing. @CurryPuffy – healthier looking without powder sugar + bacon and sausage! You can be my nutrition guide any day. I’m looking high and low for the nutrition information per serving. I started salivating as soon as I read the title. You make gorgeous food (and I wish I could taste it.) Tell Tawn he is blessed to be married to a good cook! @christao408 – quite the contrary! one of the main reasons why i worked at the italian place was because they did not follow recipes- there’s a general guideline about ingredients but during execution we did it all by taste. i think youre talking about sticking to traditional cooking techniques.. but i think it’s pretty awesome that you are so motivated to experiment with whatever works for you. i was talking to a friend the other day and we were saying how maybe starting to cook at home (before cooking professionally) would have been the best path.. cuz then you really get as much time as you allot for yourself to explore/ be creative, and/or do things the ‘correct’ way before you become a machine that just bangs out food (–>jaded talk)! curious about who chose the color for the kitchen aid?! Darn you! It’s after midnight and after reading & seeing your pictures my mouth is watering and I’m hungry! I love the overnight pecan carmel french toast too!